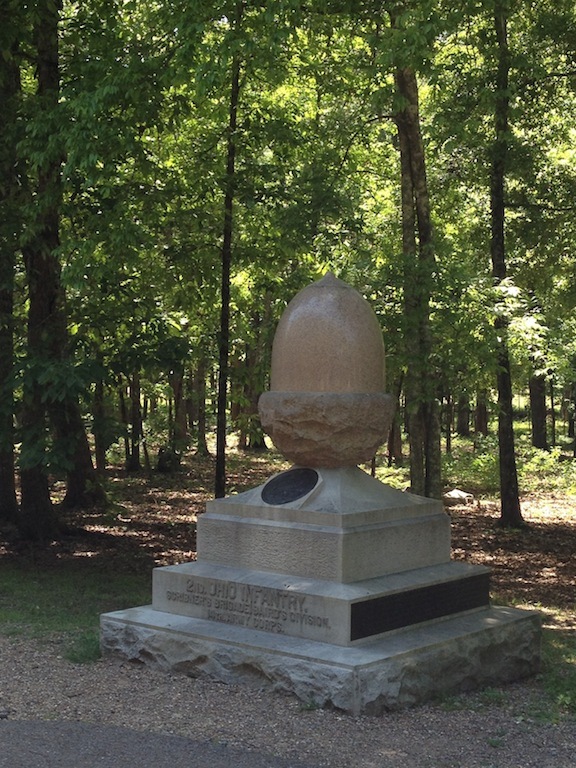 The monument to the 2nd Ohio Infantry took its design in honor of the XIV Corps, which adopted an acorn as their symbol following the campaign for Chattanooga. The acorn was chosen by Gen. George Thomas because his men stood like oaks at Chickamauga. The symbol appears on a number of XIV Corps monuments. Thomas’s men had been given extra time to fortify their position on the morning of September 20 because Confederates delayed their attack. Gen. Braxton Bragg ordered an early assault but several of his subordinates balked, claiming they were confused. The prickly D. H. Hill, in particular, came up with a litany of excuses. Not until around 9:40 a.m.—four hours after Bragg had ordered the attack to start—did John Breckenridge’s division finally move forward. This entry was posted in Battles, Monuments, Sesquicentennial, Western Theater and tagged 2nd Ohio, Battle of Chickamauga, Bushwhacking on a Grand Scale, Bushwhacking-photography, Chickamauga, D.H. Hill, George Thomas, John Breckenridge, Lee White, XIV Corps. Bookmark the permalink. One of the cooler monuments, imho.